Dave Castro, Nicole Carroll and a host of athletes and affiliate owners recall the workouts that made an impression in the year that was. 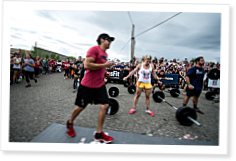 Early in 2013, CrossFit Founder and CEO Greg Glassman and Dave Castro, Director of the CrossFit Games, sat outside a Starbucks in Carlsbad, Calif., brainstorming about the last workout of the 2013 Open. The meeting over coffee resulted in Open Workout 13.5, which was performed by more than 120,000 athletes. Castro revealed the combination of thrusters and pull-ups at a live event in Santa Cruz, Calif., in front of close to 2,000 spectators, and the announcement was simultaneously broadcast online to a global audience. “That morning in Carlsbad, creating that workout with (Glassman), and that evening of announcing it are part of the reasons this is one of the most memorable workouts of the year for me,” Castro said. CrossFit athletes do hundreds of workouts a year. Most fade into a haze of sweat, pain and euphoria once the reps are finished and the time runs out. But not all are so easily forgotten. As 2013 comes to a close, we asked people throughout the CrossFit world—from Games athletes to affiliate owners to CrossFit Inc. staff—about their favorite challenges of 2013, whether it was a workout they did, programmed or just watched someone else suffer through. 2min Defense Team WOD: Tony Beats Chuck!! Hated the half marathon row, Hotshots 19 was a great workout for a great cause. Inside the box the best WOD was at CrossFit Exe (Exeter UK), 3 RFT 800M run, 15 Ground to Overhead (60kg) and 15 strict pull ups with a 20 min time cap or 50 Thrusters for time (pick you own weight - went with 135 lbs) at RARE CrossFit Fredericksburg VA. Happy New Year CrossFitters around the world. My most memorable workout for 2013 took place at my CFL1. It was three rounds of 15 Thrusters and 12 burpees, with a 10 minute time cap. What made it so amazing was how everyone way cheering for me as I attempted to finish. I finished under the time cap with only seconds to spare and the only reason I finished was because I had my class mates there cheering me on. Most memorable had to be the first team workout at Regionals. My mother and I competed for Champlain Valley CrossFit up in the Northeast region and we were chosen to do this workout together. It was an incredible experience getting the chance to perform a classic benchmark workout with the person who originally got me started on my CrossFit journey three years ago. Not only that but we killed it, both of us getting a new PR and finishing 5th overall in our region. It was a moment I know neither of us will ever forget, Mom and Son in the top 5. My husband and I's most memorable workout of 2013 was the August 31 WOD created for the 19 Granite Moutain Hotshots. Being a part of the Hotshot Fire family and seeing all the hard work come together at our boxCaptain Crossfit, was amazing. The workout was tough. We got friends and family who have never done Crossfit before to participate for a good cause. It was such an awesome day to see the friends and family together with the elite Crossfit athletes doing the work together side by side! It will be hard to make a more memorable WOD than that, for us. Thank you Crossfit for honoring our guys with their own WOD. For those that were close to them it meant so much to us. It also helped in the healing process!